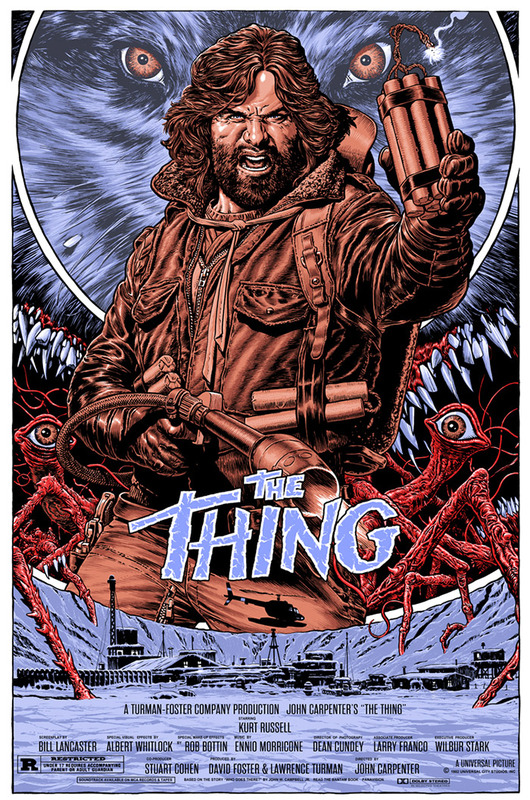 Chris Weston recently declared via twitter it was "Kurt Russell" week (Aug 2013) and then dropped 3 awesome poster designs on his website covering 3 of Kurt’s best films; This excellent "The Thing" design, One for “Big Trouble in Little China” and one for “Escape From New York”. Amazing work. We’re unsure if they're ever be made available for sale, but I’ll update this post if they do. Back when everything that director John Carpenter touched turned to gold, he gave the world one of the best scifi/horror movies ever. The Thing. Starring Kurt Russell, the story follows a group of scientists in the Antarctic who are confronted by a shape-shifting alien that assumes the appearance of the people that it kills.